Your face and your frames affect your vision. 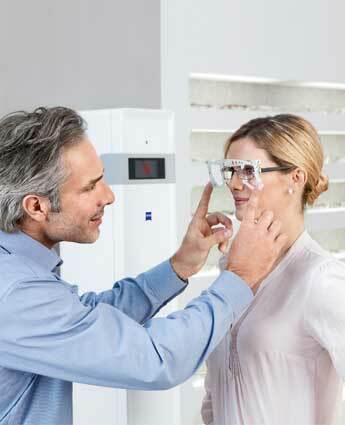 See how technology by ZEISS brings it all together at Texas State Optical in Spring, TX. Proper lens placement within your chosen frames is as important as an accurate prescription. Proper lens positioning minimizes headaches, incorrect body posture, and eye strain. Many details need to be taken into account, such as the distance between the eyes and pupils, the proportions of the face, the tilt and wrap of the frames, and even posture, to accurately position the lenses within the frames. Without these measurements, up to 40% of valuable visual acuity can be lost. This is important for single vision lenses and especially important for progressive lenses. With the i.Terminal Mobile by ZEISS at TSO Spring Rayford, all of the necessary measurements are captures in only 60 seconds – to a precision of 1/10th of a millimeter – to create lenses made for your unique features. Your vision challenges are unique and the solution should be too. ZEISS precision lenses are precisely personalized for more relaxed vision. Call Texas State Optical Spring Rayford at (832) 791-2020 to schedule your appointment today.